Tired of farming Silver and trying to raise your stats? 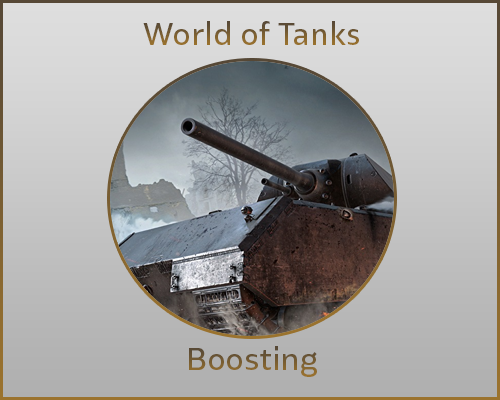 We can help you, with our WoT Boost you can get up to 1-3 million silver per day, better stats, a lot of experience and overall a better efficiency. We also offer you the possibility to choose from a few special options such as Replays or Stats screenshots. Feel free to ask for more information on our 24/7 Live Chat! Where will I receive the replays/screenshots? No, our boosters will focus only on finishing the boost without speaking to anyone unless you request them to do so. Can I play on the account during the boost? Yes, you can play on your account but make sure to tell your booster about it before doing so! Orders are normally started within the first 15 minutes after purchasing. World of Tanks is currently ranked as the ultimate gamers choice. If you are a gamer, you must have heard or even played this “deep game”. It got its nickname due to its extremely difficult tasks. However, several gamers have achieved high ranks in this game. Some have even reached as far as the last level. So, what’s the secret to cracking the nutshell? Read on to know the secret. WoT is not a strategy game. However, the strategy involved in the game is breathtaking. To win the game, you have to strategize. You can either destroy all enemy vehicles or simply capture the enemy base. You get to make the choice, but the fact is that neither of the options is easy. If you decide to take the first option, you have to drive to the enemy base. The same applies to the second option. So, how do you make it to the base undetected? The strategy employed varies from one gamer to another. You have to balance between mindlessly shooting your enemies and choosing the right weapon at the right time. This is actually one of the key things that make WoT a great game. A good gamer understands the importance of investing in a powerful graphics card. To enjoy the full capacity of WoT, you need a graphics card that can play on high settings and integrate the full-definition features of the game. By doing so, you will clearly see finer details such as blades of grass, deep shadows, and even detailed houses. You will also notice an improved gameplay with less sluggishness. Who likes a long mission that takes hours to end? No real gamer would like that. Battles in WoT are automatically set to end after fifteen minutes or sooner. This gives you enough time to completely enjoy the game without tiring or getting exhausted. So, if you are waiting for a pizza delivery, a phone call, or a friend, there is enough time to go online and shoot some tanks. Surprisingly, WoT is free. Although you might spend money upgrading your ammo, buying WoT rank boost, or paying for more experience points, it’s definitely optional or non-essential. You can actually play the game without spending a cent. An experienced gamer is more interested in gaining experience (XP) rather than simply winning the game. However, WoT caters to both interests. You can either seek to play with a short-term goal of winning or with a long-term goal of gaining XP. By playing with the long-term goal, you gain access to better tanks, play challenging battles, or even purchase better weapons. This goal is indeed awesome if you want to take the full advantage of the game and test your limits. If you love challenges or enjoy the mere thrill of winning battles, WoT is your ideal game. Nonetheless, if you are dipping your feet in the gaming world for the first time, you will also find this game quite easy as anyone can quickly grasp the concept mainly due to its criterion of play. Furthermore, if you want to fully enjoy the game, consider boosting your ranks for more captivating missions. Why Boost your WoT Rank? It’s no secret that reaching higher haikus in this game requires hard work. WoT has a ranking system that matches a player’s skill set and level of expertise to other online players. This means that the higher you prosper on your ranks, the harder the challenges become. You will sometimes find yourself stuck on a certain level. In such cases, consider boosting your rank. You can do so by using WoT rank boosting. So, how do you get this WoT rank boosting? You can make your purchase here at ProBoosting and comfortably climb up the ranking ladder without wasting too much time and effort. Here at ProBoosting, we put into consideration your needs for increasing your ranks and work on giving you exactly what you need. Purchasing this product will provide you with opportunities for greater ideas and a chance to grow while learning new strategies to deal with your opponents. One of the best things about buying WoT rank boost from us is that you will be able to comfortably get out of stagnating positions without breaking a sweat. Are you willing to explore beyond your current position? Make the purchase now and rank up. At ProBoosting, we let our services do the talking while you make the judgments. If you are not familiar with our services, below are some of the things you should expect from us. We offer a live chat window at the bottom right-hand side of the main website. Our professional customer care agents ensure all your needs are fully covered in the shortest time possible. At ProBoosting, we understand your need to get back to your game as soon as possible, and therefore, provide a 24-hour service. Our services are extremely fast and will only take around minutes to solve your problems. If you read through our customer's feedback, you will get a hint on how reliable our banking methods are. Our payment methods are extremely fast, and it might probably even take you only minutes to complete your payment. We value the power of gaming. That’s why we strive hard to make your gaming experience the best. Purchase Wot rank boost now and enjoy a smooth gaming adventure.